Happy Holidays! It’s a SNOW DAY(!!) here in Denver, which has really got me in the holiday spirit. I’ve got my eggnog latte in hand, feet kicked up, and a fire blazin’. Ahhh. I’m planning on putting my planner together next week, and am psyched! We weren’t able to print a bound version of the planner for the calendar year, but are excited to have a digital version available AND the colorful academic planner! We’ll print it for you on thick, smooth paper with a full color-bleed, and ready to bind on your own. No hassling with printing or forking over a bunch of money at a print shop! If you already have a planner, or won’t be in the market for one until the next school year, we’re looking forward to releasing a bound version of the Time & ToDo Planner with some featured upgrades to the existing design. Get the Time & ToDo Planner! I’m normally all about coffee, coffee, coffee, but am changing it up this year with an option for the tea lovers. I’ve just been venturing into the world of Yerba Mate, and this little guy has been a handy way to brew a yummy mug at school. Oh man. When I first discovered these pens, I had no idea how I had ever gone so long with out them. I mean, you can write in pen, AND erase! So cool. They’re the only pens I can use with my planner, since I’m frequently switching things around in my weekly schedule. You’ve got to try them! I carry my pencil pouch with me everywhere. It holds all my erasable pens, some wash tape, and whiteout. This would be a great, inexpensive gift for a teacher friend. I just ordered this calendar, and it’s sweeeeet! I plan to use it to map out my big goals and plans for the year. It’s large and in charge, so I’ve posted on the wall in my home office so it’s always staring me down, and reminding me of where I should be headed. No excuses! I always have to throw a water bottle in the mix, and this one is my new fave. It comes in a great size and shape to easily fit in your bag, and the color and style options they offer are super cool. How about a new Arc Notebook for your Coaching Kit and/or planner? Levenger has come out with some nice new options, and I’ve always loved this quilted one from Staples. When Luke ordered one of these a month or so ago, I kind of thought, “Huh? You ordered a coloring book? ?” But then I checked it out further and they’re actually really neat. They’re supposed to be especially helpful for stress, so the next time you’re having a stressful day at school, maybe just whip out your coloring book at lunch to help you bring it down a notch or two. There may not be a better gift you can give a friend, or yourself, than the gift of time. That sounds kind of cheesy, but really it’s true! Instacart has saved me a good two hours each weekend on grocery shopping, and I love it! It’s becoming available in a growing number of areas, but if they’re not where you’re at yet, maybe you can think of another way you can do some outsourcing in 2016 and save yourself some time. Give the gift of learning! I’ve read/listened to so many great books on Audible, and mostly while on my commute or walking Sombra! 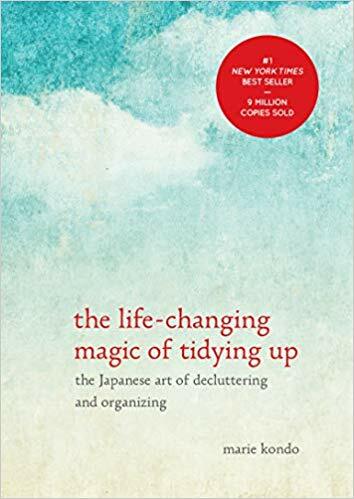 Listening to books is a terrific way to sharpen your saw and maximize your time. Hope this post gave you a few good ideas. As we wrap up this week and head into a few weeks off from school, I’m wishing you warm snuggles by the fire, golden champagne, and all the joy and happiness this season brings. Thanks so much for sharing some of your valuable time with me this year, and I’m looking forward to a great new year! 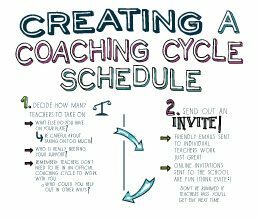 What is the number one, most valuable resource for coaches and teachers? 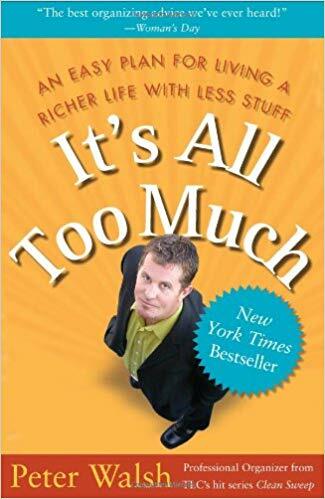 As you know, we really need every single minute of it to get done everything we need to get done in our busy days. So there’s nothing worse than when our time is wasted. And you know what one of the biggest culprits can be? Meaningless Meetings. Sure, meetings (planning meetings, PD meetings, business related meetings) are an essential part of working in a school. But if run poorly, they can be a huge waste of time. But good news! As coaches there’s something we can do about this. We facilitate lots of meetings, so let’s make sure the ones we’re responsible for leading are meaning-FULL, not meaningless. I thought it might be helpful if I walked you through a case study of what it can look like to put this plan into action. OK. So earlier this week I facilitated a curriculum planning meeting with our fourth grade team. Here’s how I went about making sure I had all my ducks in a row and the meeting was a meaningful use of this team’s time. To help me identify an outcome for our time together that felt supportive to the team, I sent out an email the week prior to meeting with them. After I received their response, I was able to create a purposeful agenda aligned to their needs. I always try to think about what resources (books, videos, examples, planning templates, etc.) 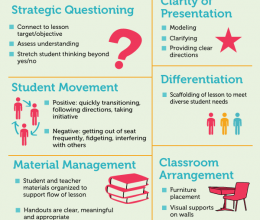 would support teachers in the work they’re setting out to accomplish. In this particular case, I thought it would be helpful to give them a planning template they could use to help them with the logistics that go into planning a Celebration of Learning. In curriculum planning meetings, there’s frequently a good amount of collaborative work and thinking going on. Google Docs/Drive makes it super easy for me to capture this work and share it with the team afterwards. I have lots of thoughts and ideas I’m excited to share with teachers in planning meetings. But I zip it up, and listen first. Then I can guide the discussion as needed with follow-up questions or suggestions. As the facilitator, it’s my role to track time and keep the team’s work on track. Since we only have 45 minutes for these planning meetings, this is super important. Including the estimated amount of time for each part of the agenda helps with this. Don’t forget to leave 5 minutes at the end of your time to review what was covered and identify next steps. AND set a time/day for when you’ll follow-up. And BOOM! You’ve got yourself a meaning-FULL meeting. 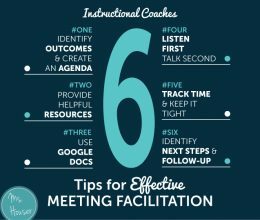 If you have an upcoming meeting to facilitate, hopefully you can use these tips as a roadmap to get you started and check your work. Have a question, or maybe a tip I didn’t include? Share it in the comments below. Enjoy your weekend and I’ll talk to you soon! P.S. If you liked this post and found it helpful, I’d GREATLY appreciate if you helped me spread the word using the share buttons below. Thanks! The Time & ToDo Planner – 5 Years In the Making! One Sunday night back in 2010, I picked up my notebook and started to draw. 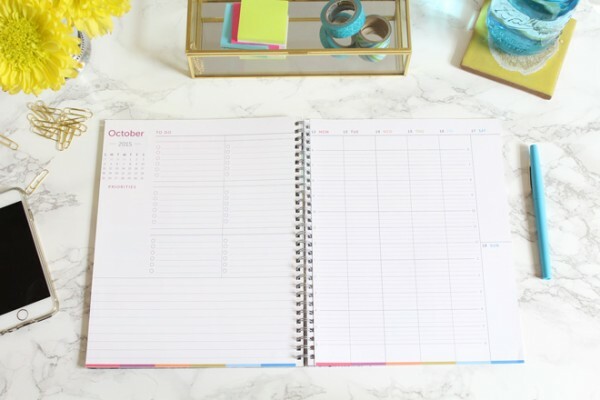 The new school year had just started, and I found myself suffering from that feeling of “too much to do and not enough time.” So I started sketching out a planning template that would allow me to organize everything that was in my head into my notebook. With everything on two facing pages, I could see my weekly schedule, priorities, and to-dos at the same time. I wanted everything together, not spread out between screens, sticky notes, or different pieces of paper. It was around this time that my journey into design and creation began. 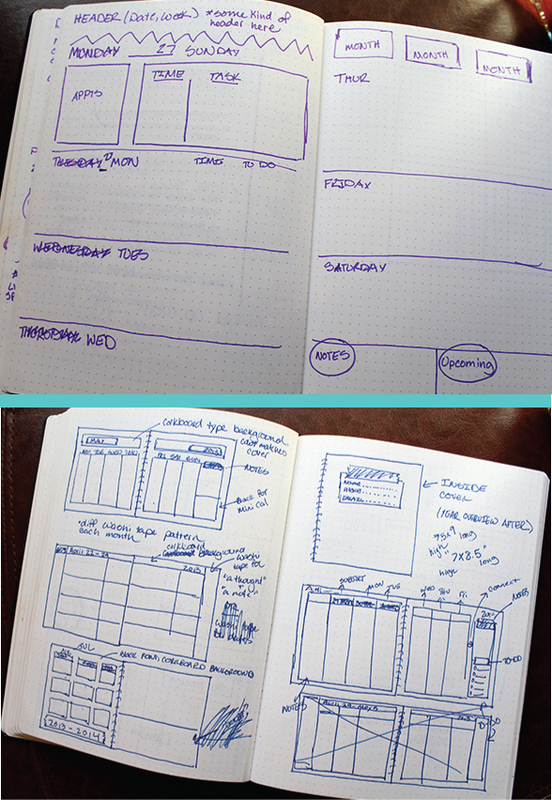 I wanted to learn the design skills I needed to bring my planner sketches to life. So I signed up for a few classes on how to use Adobe Illustrator, then Photoshop, then InDesign and worked away on creating different planning tools after school and on weekends. In March of 2013, I decided I would share one of the weekly planners I had created on my blog thinking other teachers trying to juggle everything, may like to use it too. Turns out, lots of teachers found it helpful! Three years later The Peek at the Week post was still one of my most popular, and the weekly planner was downloaded by 1,000’s of educators. I took this as a little sign that maybe I wasn’t the only one trying to figure out the “too much to do, not enough time” feeling. 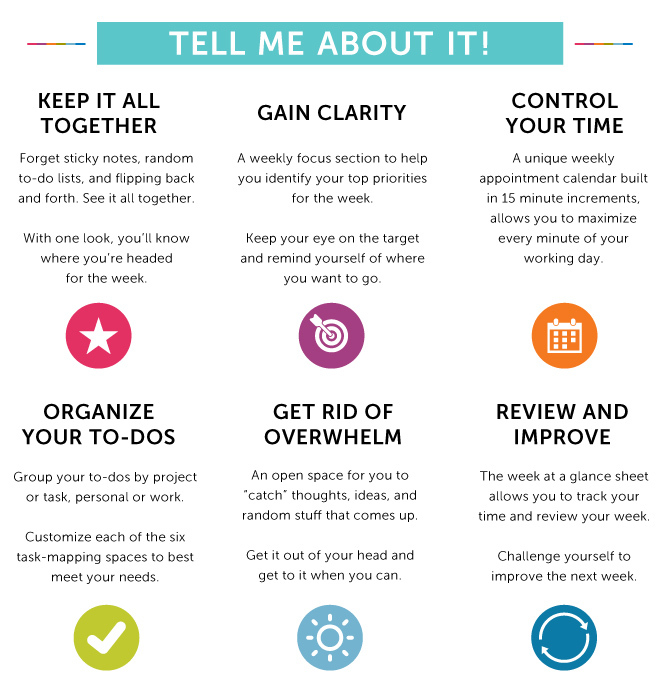 Maybe I could make an upgraded version of the Peek at the Week planner, designed especially for teachers and other busy, creative professionals to help them manage their hectic weeks. It was here that the Time & ToDo Planner really started to come to life. For the past nine months, I’ve been designing, tweaking, and testing….little by little, week by week. After lots of drafts, I finally found a design to run with. A weekly layout that has helped me manage my time with my to-dos, providing a balance of flexibility with structure, and some style. So now, 5 years later, I am super, super excited to share the culmination of this work: The Time & ToDo Planner. 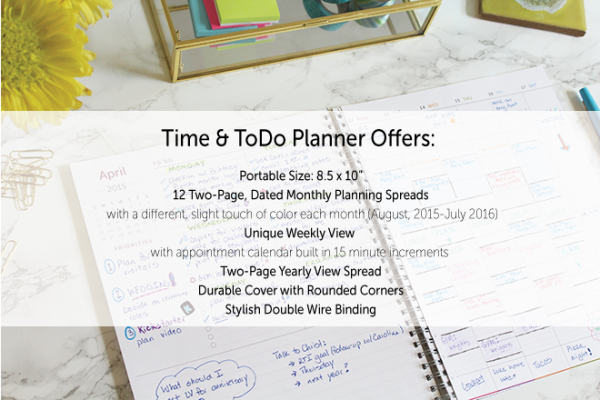 A planner designed for the busiest of busy professionals…you! And your TO-DOs on the other side! If you’re not familiar with Kickstarter, it’s super cool and super easy to show your support. Just click on the amount you’d like to “pledge” towards the project. When my funding goal is reached, production will begin and planners will be shipped! 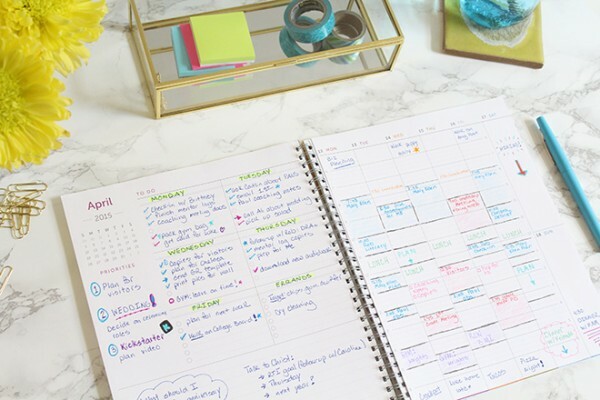 My goal is to have your planner in your hands by early July, so you’ll be ready to plan and prepare for the new school year. The foundation of being at the top of your game as a coach and/or teacher, is being planned, prepared, and organized. And I’m confident this planner will help get you there! Whether it’s with a pledge or a share, your support at any level would mean so much. 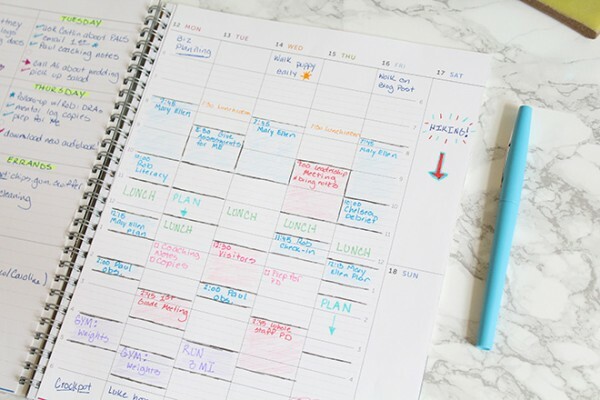 When you close your eyes and dream up a vision of your perfect planner, what do you see? Would it be professionally bound and ready to go with a stylish cover and a sturdy inside pocket? 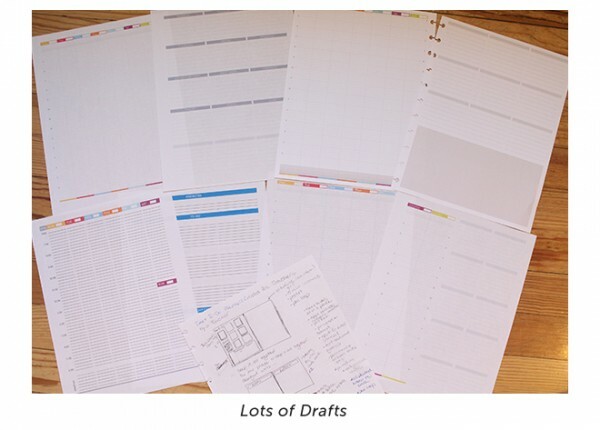 Nice paper to record your meetings, notes, and to-do’s on would sure be nice too. And how about a ribbon bookmark to neatly mark your place? It’s fun to think about isn’t it? 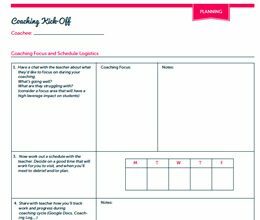 Well I’m gearing up to begin designing and building The 2015-2016 Simplified Teaching/Coaching Planner and I want to make sure it’s better than ever. 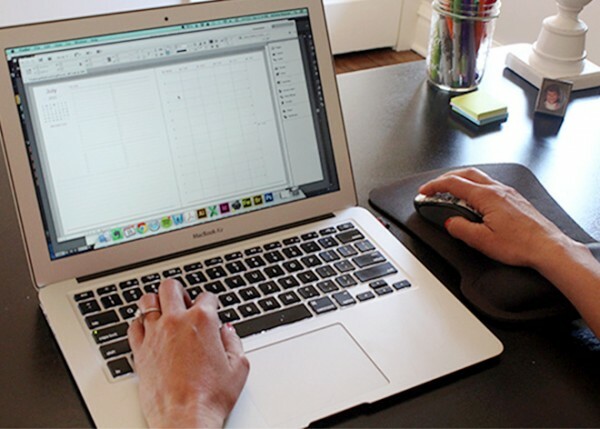 I’m ready to get creative, think big, and design just what you need. But I need you and your ideas to help make this happen. Because Valentine’s Day is right around the corner and I want to share some love with you, my fellow coaches and teachers, in exchange for your ideas, I’m offering up a pretty great giveaway. A 2015 Monthly Calendar, pre-printed in color on high quality paper, punched for your planner AND mailed right to your doorstep! 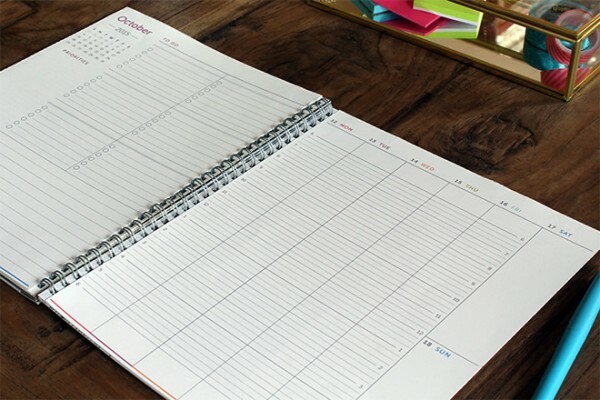 Just let me know what you would love to have in your ideal planner. Answer the questions below for a chance to win a printed, punched and shipped 2015 Monthly Calendar. 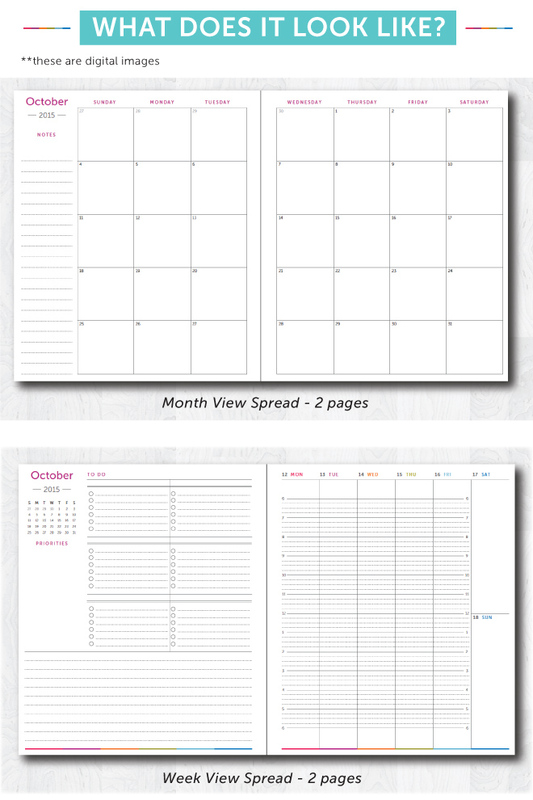 The calendar includes a Year at a Glance spread and January 2015-December 2015 Monthly Planning spreads. 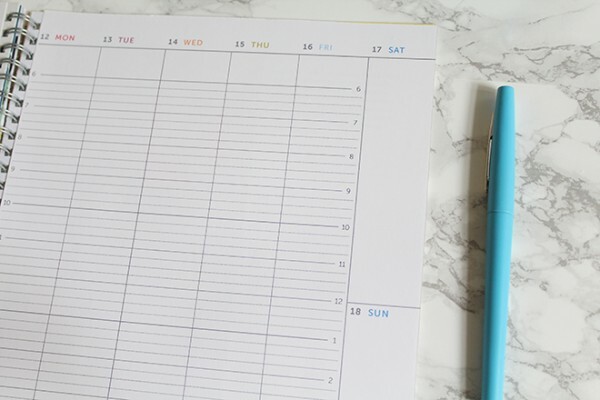 The days within each month are lined to provide more clarity and organization for the listing of your important meetings and monthly deadlines. 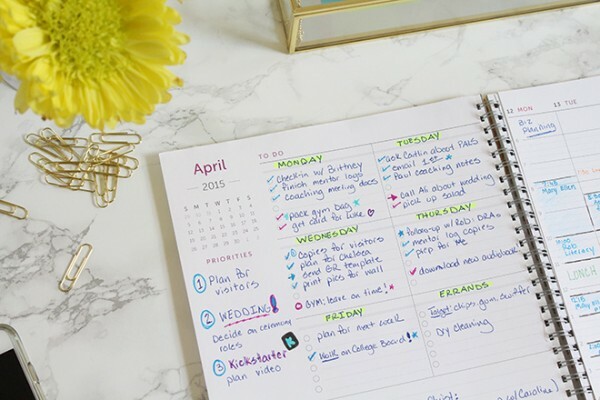 Use the shaded spaces for recurring events or extra important monthly reminders! Want to receive updates right in your inbox? Send for a chance to win! Winners will be announced by February, 16th. Thank you to everyone else who took time to provide your input on what you’d love to have in a planner – I’ve got a plan! And please, feel free to email me with any additional recommendations you may have.